The following is a new feature from ISIS Europe called Policy Briefs. Policy Briefs provide relevant background and succinct recommendations to international security concerns across the globe. Thailand, or officially known as the Kingdom of Thailand, is a constitutional monarchy since 1932 and it is situated in the central part of the Indochina Peninsula in Southeast Asia. One of the more prosperous economies in the region and a favoured tourist destination, the country has experienced numerous coups and attempted coups, with the more recent one led by Army Chief, General Prayuth Chan-Ocha. Thailand’s propensity for military overthrows stems largely from the fact that the military has enjoyed privileged authority and control over Thai politics, the latest coup falling within the traditional pattern of military intervention to allegedly solve the country’s political crisis and the long-running societal rift. In the coup’s aftermath, political leaders from both the pro-government “Red Shirts” and the anti-government People’s Democratic Reform Committee (PDRC) were detained at an army base and martial law was declared to restore the country’s security. The latest coup d’état in Thailand should not be counted as an exceptional incident in the country’s tumultuous history, being yet another overthrow in an array of over 20 coups since the 1930s – the current takeover under the leadership of Army Chief, General Prayuth Chan-Ocha, is the 12th successful coup in a long series during the 80 years of constitutional monarchy. After seizing power, the military established the National Council for Peace and Order – the chosen name of the military junta, abolished the 2007 constitution with the exception of certain provisions concerning the monarchy, and declared martial law on May 20, 2014, two days after seizing control of the government. The question to be asked is why does Thailand have so many coups or more specifically, why are coups d’état the preferred form of political expression in Thailand? The institutionalization of coups in Thailand comes as a widely accepted political act and traditional power seizure in Thai society, with the coups themselves usually bloodless and benefiting from popular acceptance. The coup makers enjoy full governmental and constitutional control and, more importantly, they typically receive royal amnesty or avoid subsequent prosecution for their actions. The authority of the coup groups is symbolically limited as regards the promulgation of a new constitution, which still requires the King’s royal signature, as a legitimizing seal of approval in front of the Thai population. The King enjoys an elevated status and he is conventionally seen as a stabilizing force in Thai politics, with few expressed critical voices against the role of the monarchy. The recent coup came after months of political turmoil between the fractious pro-government “Red Shirts” leaders and anti-government street protesters, caught in a vicious circle of disagreements over Thailand’s democratic future. The term coup d’état usually refers to the seizure of power, most of the times through forceful means, and it is considered to be successful when the coup makers or usurpers establish an uncontested dominance. Coups are usually considered outward signs of an ailing society, indicative of a dysfunctional economy and a weak or failing state. 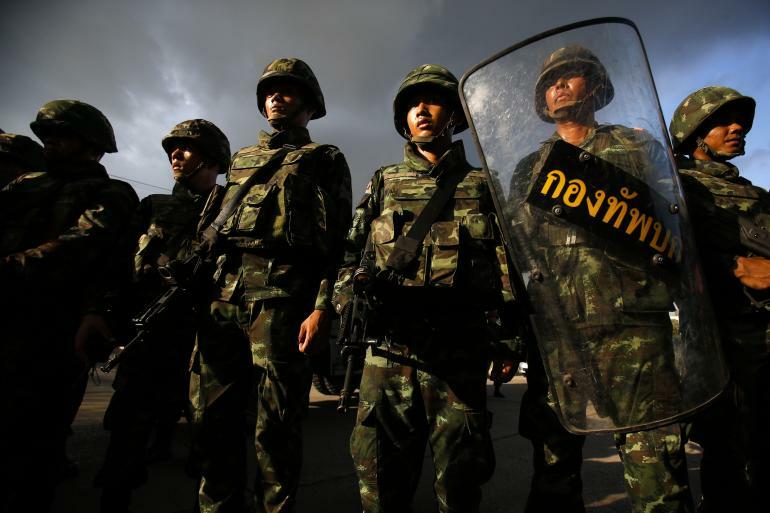 According to the definition of a coup, Thailand’s overthrow is not what can be officially termed as a full-fledged coup d’état, but rather falls into the category of a military-type intervention. The military is one of Thailand’s most powerful and feared institutions, known for the violent suppression of popular movements and the arbitrary use of force. In Thailand’s case, the coup orchestrated by General Prayuth Chan-Ocha is a usual occurrence in the country’s history, by which the controversial Army Chief and avid monarchy-supporter was exercising the traditional prerogative of Thai army commanders, as self-proclained protectors of the constitutional monarchy. An ardent adversary of the former Prime Minister Yingluck Shinawatra, General Prayuth Chan-Ocha gained control over the government, declared martial law, and detained at a military base in Bangkok dozens of prominent politicians, among which the former Prime Minister herself, as well as both pro and anti-government leaders. Following the overthrow, the 2007 constitution was suspended, a curfew was declared, and media censorship was rampant. The General and the military junta, endorsed by the old and ailing King Bhumibol Adulyadej, proclaimed to create a “genuine democracy” and to restore peace and security to the country. The events prompted scattered and small anti-coup protests in the streets of the capital, the small resistance receiving continued threats from the military to stop the demonstrations. On top of the martial law and the coup d’état that the military junta have declared, Thailand presents an interesting case of information war, with instances of media control and acute news censorship. In the wake of the coup, the military took charge of the information flow, exerted increased pressures on local and social mass media, and shut down several television and radio stations – with Army Chief Prayuth Chan-Ocha going as far as imposing to public media to only broadcast military-sanctioned news feeds. The freedom of speech and information were clearly targeted in a bid to solidify the martial law and to control public opinion. As well, public and private media were repeatedly warned by the military to fall in line, to behave “properly”, and not to expressly inflame the already volatile popular spirits. Social media communications were particularly targeted by the military junta, especially because they have less control over the dissipation of information through such means. Casting themselves as the lawful protectors of order in Thailand, the military believes that further censorship is justified under the current conditions so as to avoid misleading propaganda and subversive messages from underground groups. The question still remains whether this information war led by the military junta is warranted or the information lock-down is actually meant to disseminate fear and suppress potential oppositional voices. While the Thai and the global media are focusing on the situation in Bangkok, a different type of war is still unfolding in the deep southern regions of Thailand. With a crushing majority of the Thai population being of Buddhist faith (almost 94%), the South, with the three provinces near the Malaysian border, Yala, Pattani, Narathiwat, and also parts of Songkhla and Satun, is predominantly Malay Muslim (around 1.8 million). The minority versus majority type of regional conflict has deep historical roots going back to the early 20th century, when the three provinces were part of the Malay Muslim sultanate before they were annexed in 1909 by Thailand (then Siam). After their annexation, the Muslim community suffered under the oppression of the Siamese rule and was systematically discriminated. For the Thai state, the region presents a series of opportunities and vulnerabilities: on the one hand the region has strategic value in terms of a route for oil and gas pipelines on top of its touristic value; on the other hand, it is underdeveloped and fraught with numerous instabilities, mainly due to the ongoing ethnic conflict. Muslim rebel groups, and in particular the National Revolutionary Front (the Barisan Revolusi Nasional), do not recognize Thailand’s central authority, seek autonomy or complete independence, blame the government for economically discriminating the region, and have been responsible with frequent insurgency acts and numerous deaths. With continued fears that the conflict will further radicalize in the Deep South with jihadist undertones, the state forces reacted brutally on various occasions, but failed to successfully address the situation. Seen as a major liability to Thailand’s national sovereignty, the Deep South requires the attention of the Thai government in terms of capacity-building strategies. In the context of the recent events in the capital, the continued conflict in the South is less of a priority, but it can also further exacerbate the government’s authority deficit. Deeply embedded social cleavages between the poorer strata and the ruling elites on the one hand, and divisions within the ranks of the ruling class itself on the other hand, have further fueled the vicious cycle of political conflict in Thailand. As well, with the military’s activism and paternalism as common phenomena in Thai politics, can a “genuine democracy” truly flourish in Thailand? Part of the problem is that the military sees as its moral duty to intervene in the political life of the country as an impartial broker and peace-keeper. Its supposed role is to prevail, when needed, in almost a deus-ex-machina manner, in the country’s political life to solve governmental problems. The military thus replaces, on an ad-hoc basis, a healthy checks-and-balances system typical to constitutional democracies. In the short term, the political issues may be solved by the coup and the military’s interference, but on the long run the country will suffer from international isolation, a lag in political reforms, and the overthrow’s destabilizing economic effects. In the case of Thailand’s coups, the military usually hands back political power to civilian politicians, but it remains to be seen when the hand-over will precisely occur and under what terms. It is without any doubt that Thailand has a baffling political dynamics, in which the military is the controversial protagonist. A good course of action would prompt the military to utilize its newly seized power to upgrade the political reforms and to establish a “genuine” checks-and-balances system, with independent and separate judiciary, legislative, and executive. To keep up to date with the latest in European and International Security, like us on Facebook and follow us on Twitter. This entry was posted on 28/05/2014 by ISIS Europe in Policy Briefs, Raluca Csernatoni and tagged Censorship, Checks and Balances, Constitution, Curfew, Democracy, Ethnic War, information war, Martial Law, Military Coup, Thai politics, Thailand.